This was invented about half-an-hour ago when I returned home from the Mission Community Market armed with fresh greens from Happy Boy Farms and a whopping 5 lbs of heirloom tomatoes (scored for just $5!) from Tomatero Farm. I was ravenous and impatient but unwilling to settle for my standby quick meal (a quesadilla and carrot sticks—I know, I’m five). The flash-fried tomatoes were crisp on the outside but oh so sweet and ripe on the inside. This might also be nice with crumbled goat cheese or even shaved Parmesan. 1/2 cup bread crumbs $1.50 for 8 oz. 2 oz. crumbled feta cheese $3.50 for 8 oz. Beat egg with 1/4 cup cool water until foamy. Place bread crumbs on a plate. Dip tomato slices in egg wash and then immediately dredge in bread crumbs, patting them onto the tomato flesh. Set on a clean plate. Heat olive oil in a medium frying pan over medium-high heat. Place tomato slices (working in batches to avoid overcrowding pan) in the hot oil and cook 1-2 minutes on on each side or until crisp and golden-brown. Drain on paper towels. Sprinkle with salt and pepper immediately. Toss the mixed greens with 1 tbsp extra virgin olive oil and the balsamic vinegar. 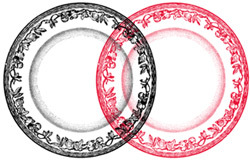 Divide between 2 plates. 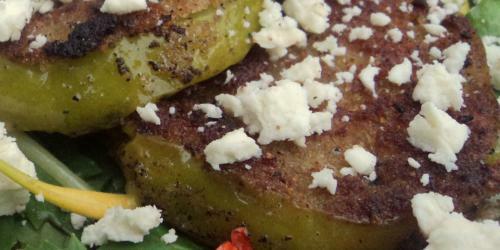 Top each plate of greens with a few fried tomatoes, feta and more black pepper. Lovely, thanks for sharing, but I could have done it for less. These are some awesome instruments that i certainly use for SEO work. This is an extraordinary rundown to use later on..